Was this story an encouragement to you? Let David know - sign his guestbook! 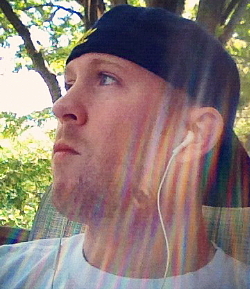 David was 27 when he was diagnosed with osteosarcoma at the humerus. He had chemotherapy and surgery. My life right before my diagnosis was going well. I sell cars for a living and was doing well at work and was happy outside of work too. What many people didn't know was that I had been living with pain and an abnormal lump in my humerus for years and years. My friends told me that I always complained about it when we were active and playing sports. I never paid it much attention because that's just who I am. I'm not one to worry too much or get something looked at if it's not bothering me too much. It wasn't really painful, but you could tell by looking at my arm that something was there that didn't belong. It looked like a huge muscle, and people actually asked me how much I worked out because of the way that it looked and felt, LOL. Still I didn't think too much of it. 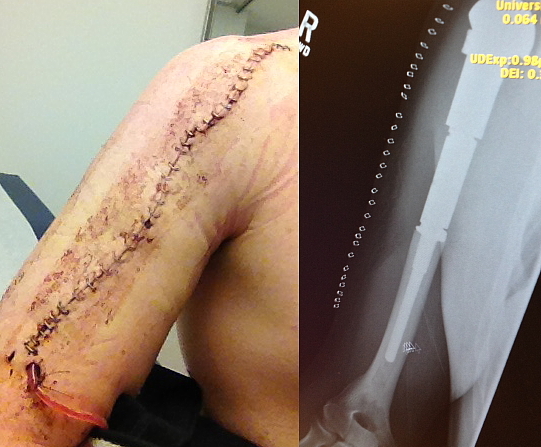 Years went by, and there wasn't too much pain in the arm, but it slowly seemed to be getting bigger and bigger. So finally one day in March of 2011 I got it looked at. They took an x-ray of the area and gave me a referral to see someone else. They didn't seem too worried or alarmed by it, but they also were not sure what it was. Since they were not too worried, neither was I. Consumed with work and my life, I blew off the follow-up appointment. I let yet another year go by until it finally got painful and big enough to scare me. In June of 2012 I got it looked at again and followed up with everything until I knew what was going on with my body. The doctors told me from the x-ray in 2011 until the new one in June 2012 the mass had doubled in size, and they were pretty sure it was one of two types of cancer. I left for Vegas for a bachelor party just after hearing that news knowing when I return I most likely will be informed I have some type of cancer. I got a biopsy shortly after I returned, and after taking a quick look at the specimen under a microscope my doctor was sure what it was and I was given the news that I had osteosarcoma. The news was devastating, but I had prepared myself for the worst, so it wasn't as hard to accept. To every problem there is a solution, and I was just eager to figure out how we were going to go about beating this and getting it out of my body. Actually, the worst part of the news I recieved (believe it or not) was when then told me they might have to amputate my right dominant arm. That's when I lost it and broke down and cried in the hospital room for the first time. I didn't cry when they told me this is a life threatening disease and that I could die, because I never believed or entertained the fact of me dying and being defeated by this disease for one second. I was more scared of the fact that I couldn't be the same fun, athletic, outdoor-loving, strong individual. Furthermore this whole time I kept everyone in my life out of the loop with me and went to all my appointments by myself. I didn't want to burden anyone with an issue that could be nothing too big to worry about. So I now had to break the news to everyone, they were caught off guard and stunned a little but they took the news as best as possible knowing they had fighter in me that wasn't going to back down easily. I now knew that I had great friends and family and a strong support system, and it eased my mind that I wasn't alone. The treatment I underwent started promptly after my diagnosis because they wanted to shrink and kill as much of the tumor before they did surgery. 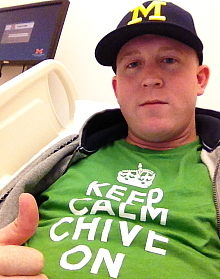 So I started Chemo in July 2012 and did 10 weeks prior to the limb salvage surgery. 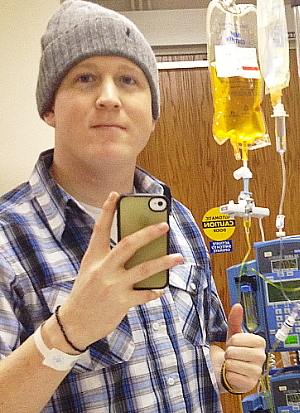 Chemo included cisplatin, adriamycin, and methotrexate. After the first 10 weeks of chemo were done I was ready for surgery (I was excited to have this operation done and get the cancerous tumor out). On September 18th, after almost 8 hours of surgery, I was finished and had a new reconstructed metal arm and shoulder joint. I spent the following week in the hospital recovering, waiting for them to take my drainage tubes out of my arm so I didn't get an infection and then to release me. That week seemed like forever. I had many long sad nights filled with tears reading other people's stories who had osteosarcoma. So many young people were taken way too early; it was so heartbreaking, overwhelming and hard to accept the destruction this disease leaves behind. The kids are what really bothered me. I had to quit reading about them because they broke my heart. Reading those stories also fueled my fire more than anything in the world ever could. It made me want to fight so much more for everyone who was taken away. It just wasn't fair. I mean there is no one you can physically take your aggression out on when you have cancer; otherwise I would have choked cancer to death a long time ago. So the only way to channel this aggression is to beat it yourself first and then help out the cancer world in any way you can and make a positive impact in the world of cancer. This is something that has made such an impact on my life that I can't possibly fathom turning my back on it. Shortly after recovering from surgery and having my arm in a super sling for two months (which is pretty much an immobilized sling you wear 24/7) I continued the other 20 weeks remaining of post-surgery chemo to keep the cancer from growing back. My doctor said for the most part I handled the side effects like a champ, I had my age and a somewhat healthy body on my side. Today I can proudly say my chemotherapy treatment is done and I threw up a total of two times over 30 weeks of it which is pretty good. I haven't lost any weight(I in fact gained about 10 lbs) and everyone tells me I look healthy. Although I did have a couple bad episodes with mouth sores, one right before thanksgiving that sucked, I would have to say that the mouth sores were the most bothersome, painful side effect I endured. Man, they were absolutely dreadful! I had to get a magic mouthwash that numbed your mouth..I could barely swallow and was on a straight liquid diet for like a week. It blew! I did also feel quite fatigued and slept quite often. It was different, going from being so energetic and active to a coach potato, but I couldn't handle a ton of activity after surgery and I would often get headaches if I did too much. I must mention I had my medical marijuana card the whole time, which did help a lot with pretty much every thinkable symptom (nausea, pain, anxiety, eating for sure, attitude). It helped time pass faster and relaxed me. It also made it so I didn't need my pain pills shortly after surgery, which was a plus. Music played a huge roll in this whole process as I knew it would. It really put me at ease when I needed it, gave me strength when I needed it and also gave me clarity when I needed it. I couldn't believe how much it meant to me and helped me through tough times and picked me up when I was down and no one else was around. It was crazy how many songs I listened to that just clicked like they were written just for me. My relationships didn't change much more than I expected. I knew my close friends and family would be there for me and check up on me and visit. My mom took great care of me. She was there the most for me, making sure I had my appointments in line and paperwork all filled out for the help I needed from the state and that I was eating well and just taking care of everything I couldn't do. I got the one-time visits from some friends that heard what I was going through. Those didn't mean the world to me but they sure were better than no visit. Anyway I had who I needed by my side, and that's all that mattered. I had two of my best friends get a Michigan banner signed by Michigan's football team 133 because they know how much I love Michigan football. They presented it to me right after my surgery while I was still all drugged up, and that was pretty sweet. The people who visited me in the hospital after my surgery were needed more than they knew it. I was down in the dumps and going through a tough time mentally after having my arm completely just taken apart and put back together but they made me smile and laugh, even though it really hurt to laugh, I didn't care. One moment I won't ever forget was when I was still in recovery. My best friends David and Preston raised my hospital bed like all the way to the ceiling and didn't know how to get it down, LOL, that was hilarious! Also they all drew funny remarks on my daily hospital eraser boards, like funny names for my nurses and things I needed in my room - like a flat screen TV, better food, strippers...they knew how to make me smile. 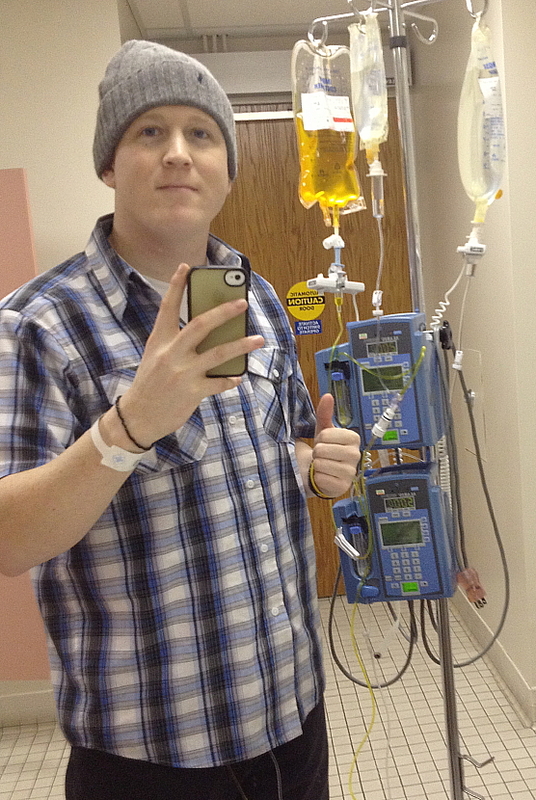 February 22, 2013 was my last chemo treatment, so I'm just now on my road to recovery. The thing that most saddens me is the fact is that I will never have the full use of my right arm back again, which I was never fully aware of in the beginning of this all. They kind of broke the news piece by piece over time, which aggravated me quite a bit. I was pretty depressed and discouraged following surgery and still am, but time is healing these thoughts daily. My pain right after surgery was pretty bad, but after a week the pain seemed to just die down. To be honest I live with very little to sometimes no pain on a day to basis, which is great. I barely take my pain pills just when I really need them, and I am going through physical therapy now in attempt to regain as much mobility as possible. It was very discouraging at first, and to me it was embarrassing as well. It's like learning to walk again for your arm/shoulder and teaching your brain and shoulder to be on the same page, it isn't that easy of a task. It takes patience, determination and a good work ethic. I have a 5-10 pound lifetime weight limit on my dominant arm, and I'm a very athletic person who thoroughly enjoys the outdoors. You name it, I'll play it or do it, which kinda breaks my heart and leaves me wondering who is going to teach my kids how to play ball, who will be able to protect my family when needed. I just have these insecurities and questions now about my arm and body. But as my surgeon told me after surgery: the goal of this surgery was to remove the tumor and save my arm and to leave me with functionality in both my hands, which they did. So I am blessed and grateful for that. I'm just concerned with how I'm going to deal with living with only one completely functional arm the rest of my life. I'm not trying to be selfish with those statements, just being honest. Well my life now is back in my control I feel like and not the hospitals, which is good because I was so ready to be done with chemo. After my last chemo treatment yesterday I really felt like a huge weight was lifted off my shoulders it was a great feeling. I feel very blessed and fortunate to have made it to where I am today from where I was ten months ago and really can't believe how fast it went by. I am so fortunate that my cancer hadn't spread anywhere else at the time of diagnosis and that all my scans and x-rays have turned out clear during treatment. I am very grateful that I was treated and taken care of at one of the best hospitals and care units in the country at the University of Michigan Comprehensive Cancer Center. It made it much easier on myself only living five minutes from the hospital, considering some patients drive from hours and hours away. 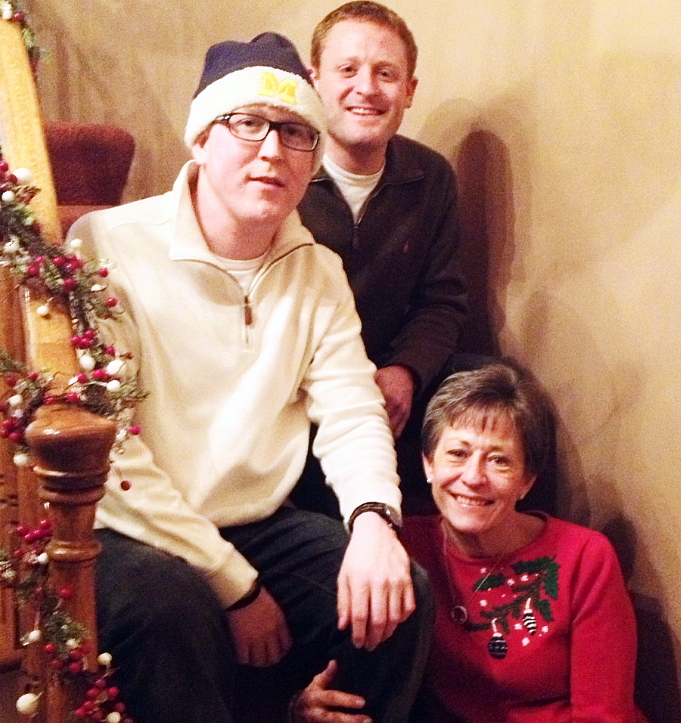 The sarcoma experience will no doubt be forever part of my life. My arm and my scars are a constant daily reminder of where I've been and where I am today. It has changed the way I look at life. I would probably say this experience aged my soul a good ten years, and it's really hard to explain to someone without cancer, but the little things just seem so much bigger and more important now. I don't take things for granted; I'm much more sensitive of people around me; my attitude, demeanor and outlook on life have been forever changed. Everything seems a lot clearer to me now...what I want out of life and how I will choose to live. I am getting ready to go back to work here shortly and am having a tough time figuring out if I want to sell cars anymore. Don't get me wrong - I like my job and my co-workers. I have a passion for what I do and it is rewarding, but I also feel that I have a new purpose in life. I feel that God wants me to dedicate my life to the world of helping cancer patients in any way I can be of most help, and I would love to do that and give back. 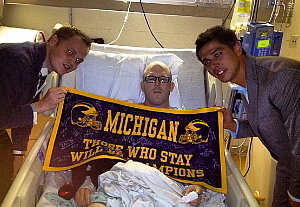 Like I said, he and the doctors and nurses here at the U of M saved my life. How can I turn my back on all these people that need help and research and funding and guidance after I was just given a second chance. It doesn't seem right, does it? I plan to take a brief vacation in March (back to Vegas! hehe) as a closure to my treatments and to clear my head and get a break. Then I'll come back to Michigan and figure out what it is I really want to pursue the rest of my life and what will make feel most happy. So until then my fellow warriors and friends, keep on fighting, keep your heads up and never give up! I like to be told everything as soon as my doctor or oncologist knows. Just like when they did my biopsy, she said, "Do you want to make an appointment and come back next week and be put under?" I said, "No, let's do it right now." Right after the biospy, "So do you want me to call you with the results when you get home?" I said, "No, tell me right now." So make sure you have a completely open line with your cancer staff. I want the news and I want them to keep it 100%. There is no need for your doctors to sugarcoat or hide anything from you. It's not like you're not facing possible death anyway - what is there to be scared of? Well like I mentioned already, the one thing I wish I had known in the beginning is that I will never be able to rehab my arm to the same condition and strength it was before. I wish I would have known I would have little mobility in my shoulder and a 5-10 lb lifetime weight restriction on my arm. I think if I had known from the beginning it wouldn't be nearly as hard to swallow now. If a friend was just diagnosed with sarcoma, I would be his number one supporter. I would tell him he is going to get through this and be just fine. He would know that I just went through it and I made it out fine. This can be a long scary road, but the more you know and the more support you have the brighter and less scary the road gets. Signatures in David's Guestbook will appear here. Please share your thoughts! Just read your story which felt so familiar to me. 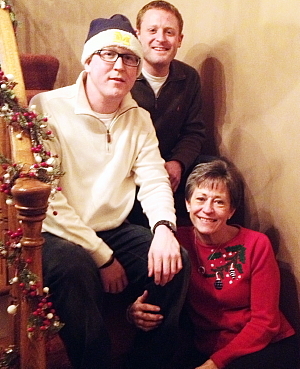 My son, John, was diagnosed at age twenty with osteosarcoma left proximal humerus. He also was treated at U of M ( Dr Scheutze and Dr Bierrman). No mets for him either although we are convinced he had the cancer for years. He is twenty six now, married and has a four month old. I hope things are going as well for you! I just wanted to let you know that your story was inspiring. My son who is four was just diagnosed with Osteosarcoma 12-16-13. We are very private people and still find it hard to talk about. I never realized how much this has taken over our lives. Evan has two brothers and a sister and has taken a toll on all of us. I still feel lost and still feel like it's a dream. So thank you for sharing your story. Copyright © 2013 Liddy Shriver Sarcoma Initiative.